Kerry Ann Rockquemore gives the Commencement address at the 2014 Graduate School ceremony. 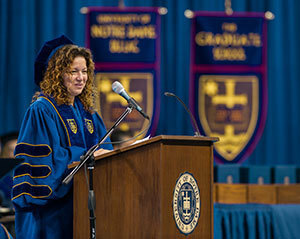 The University of Notre Dame’s Graduate School recognized 344 master’s and 204 doctoral degree recipients and presented several awards during Commencement ceremonies Saturday (May 17) in the Compton Family Ice Arena. Kerry Ann Rockquemore, president and CEO of the National Center for Faculty Development and Diversity, delivered the Commencement Address. Rockquemore, who earned her doctorate in Sociology from Notre Dame in 1999, was also recognized as the recipient of the Graduate School’s Distinguished Alumna Award during the event. After Rockquemore became a tenured professor, her focus shifted to improving conditions for pre-tenure faculty by creating supportive communities for writing productivity and work/life balance and she founded the center she now heads. In her address, Rockquemore offered the graduates three things she wished she knew when she was in their position. “I decided the best way to serve you was by speaking not as scholar to scholar but as person to person,” she said. Rockquemore first urged the graduates to develop a very clear idea of what success means to them. She noted that her academic career and reputation as a scholar were perceived as being successful, but it was not her version of success. Rockquemore’s second point stressed the idea of learning to play with possibility. She described how she and her husband take an hour-long “crazy walk” each Sunday during which they talk about growing their notions of what is possible. “Develop a habit of thinking and being as if not limited by your current circumstances,” she told the graduates. Rockquemore’s third and final point of emphasis was on the importance of finding mentors who are the exception and not the rule. She urged the graduates to find mentors whose entire careers were about change and not simply profit. Full story originally published by William G. Gilroy at news.nd.edu on May 17, 2014.